I was really craving a big Greek-style salad the other day and, although, as a vegan, I could bring together nearly all the ingredients to fashion one, there was one glaring omission: feta cheese. That tangy and salty flavor coupled to a creamy and crumbly texture; oh how I miss feta. It was time to go back to the kitchen and tinker. 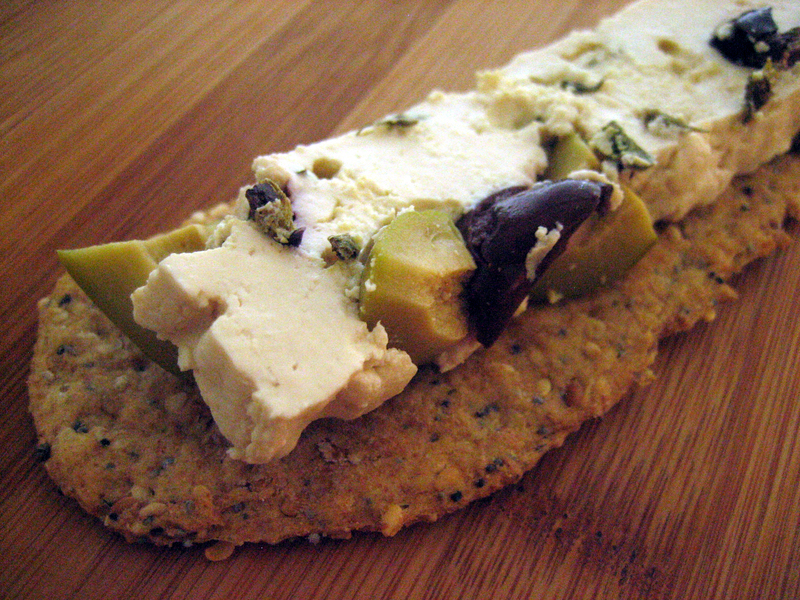 Turns out, this tofu is delicious enough to stand on its own merits and serve as the star of the show upon a homemade flatbread cracker. It’s not nearly as salty as feta cheese, but it’s a really nice compassionate stand-in that has worked very well in all the dishes I’ve since used it in. Plus, it’s just am incredibly beautiful bite of food. Once you have the tofu at the curd stage, drain in a cheesecloth-lined colander. Transfer to a bowl and add all of the ingredients. Gently mix to incorporate. Let sit for one hour at room temperature to marinate. Transfer to a cheesecloth-lined tofu mold and press for an additional hour. Wrap in plastic wrap and refrigerate. I’m sure the level of saltiness can be tinkered with, either by adding salt or by increasing the marinating time. There are so many flavored salts out there these days that I’m sure one of them would be perfect for this. That is beautiful! 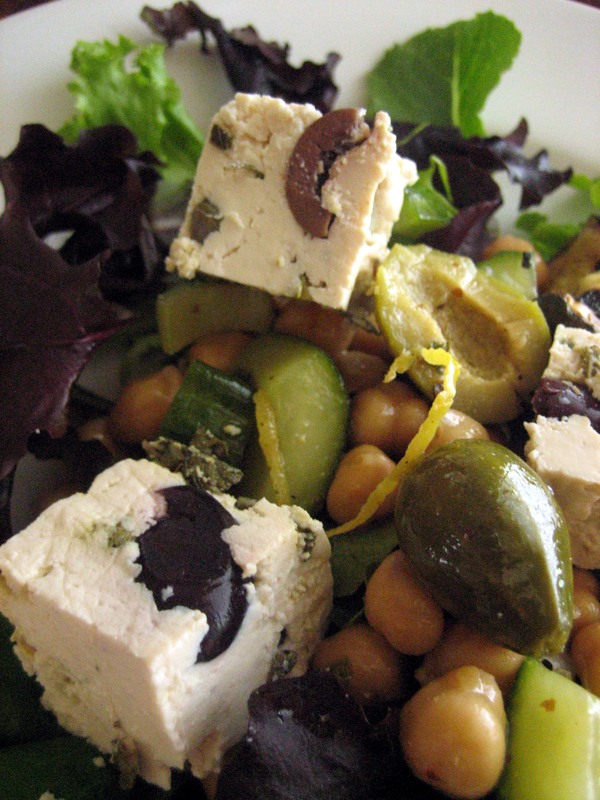 I reviewed a storebought soy feta on my blog, but it didn’t have the creaminess factor. I’d love to try your version! Thank you Dianne. I have another version that’s similar yet remarkably different. I’ll be posting that soon. I love to tinker with flavors and textures in the kitchen and to encourage others to play too!